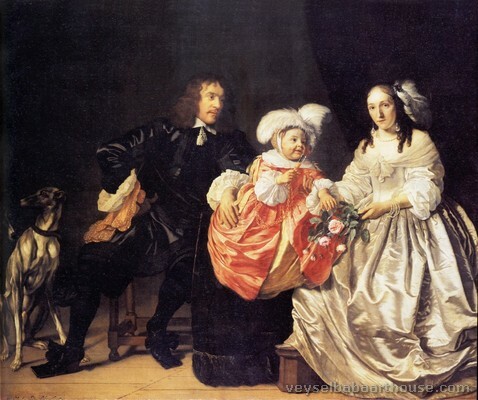 Bartholomeus van der Helst (1613 – buried 16 December 1670) was a Dutch Golden Age portrait painter. Born in Haarlem, the son of a Haarlem innkeeper, Van der Helst moved to Amsterdam some time before 1636, for he was married there in that year. 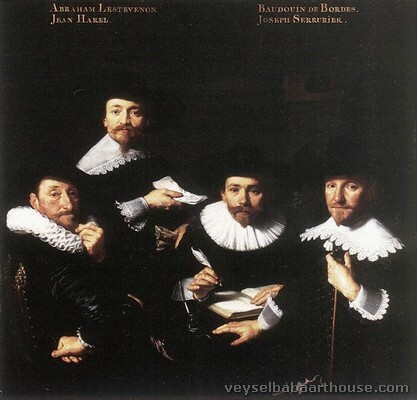 His first dated picture, a group portrait of the regents of the Walloon Orphanage (currently the location of Maison Descartes in Amsterdam), dates from 1637. 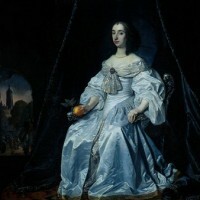 It is unknown from whom he learned to paint, but in Haarlem he must have at least known the work of Frans Hals, who like him, never traveled to Italy and specialized in portraiture. Hals refused even to travel to Amsterdam to paint the lucrative schuttersstukken, and a few years after the trekschuit made commuting to Amsterdam possible in 1632 he attempted this in 1636 with the De Magere Compagnie, but gave it up and let Pieter Codde finish it. As the son of an innkeeper with ever-increasing trekschuit patrons, van der Helst would have seen immediately the importance of this and the relative value of Amsterdam above Haarlem. In any case, he moved to Amsterdam and in 1639 he won his own schutterstuk commission, The company of Captain Roelof Bicker and Lieutenant Jan Michielsz Blaeuw. In Amsterdam he may well have trained with Nicolaes Eliaszoon Pickenoy. 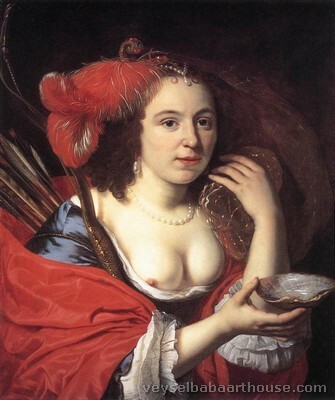 In Amsterdam Van der Helst was a contemporary of Rembrandt. 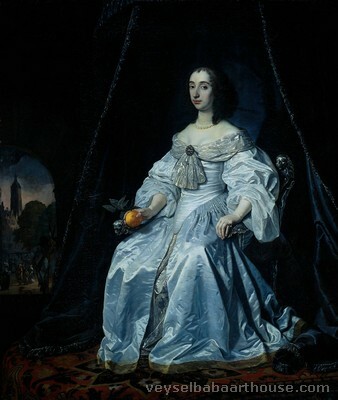 He soon became the most popular painter of portraits in that city, his flattering portrayals in the style of Anthony van Dyck being more immediately appealing than Rembrandt's dark and introspective later work. 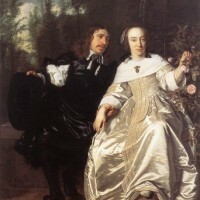 Some of Rembrandt's pupils, including Ferdinand Bol and Govaert Flinck, adopted Van Helst's style instead of their master's. 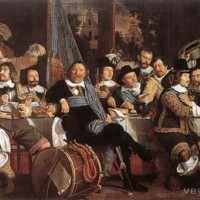 His large group portrait, Banquet of the Amsterdam Civic Guard in Celebration of the Peace of Münster, was painted in 1648, and exhibited to popular acclaim. It was this painting that sealed his fame for future generations, according to Arnold Houbraken, and it was admired by Godfried Kneller. When Joshua Reynolds visited Amsterdam in 1781, he praised the painting as "perhaps, the first picture of portraits in the world, comprehending more of those qualities which make a perfect portrait than any other I have ever seen". On 25 June 2006, Hans-Joachim Bohlmann, who had already caused an estimated 130 million Euros damage in similar attacks in Germany, intentionally damaged the painting by spraying lighter fuel on its surface and lighting it. Only in January 2005 Bohlmann, having been held in psychiatry for more than 16 years, had been released by a court ruling that, although psychiatrists still saw a high risk for further attacks, such risk for property could not lead to a life sentence. Although the damage this time was mostly to the varnish layer, some parts of the original paint and cloth were also afflicted as well as the frame. He was the teacher of his son Lodewijk van der Helst who followed his style. He died at Amsterdam in 1670. 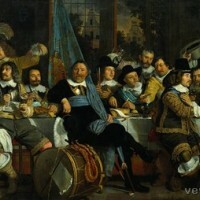 Banquet of the Amsterdam Civic Guard in Celebration of the Peace of Münster, painted 1648, exhibited at the Rijksmuseum. 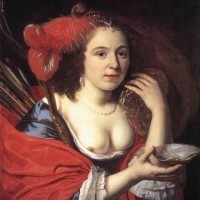 "The widow of Bartholomeus van der Helst, in life a very respected and artistic painter, is willing to sell all of his works, including many large pieces, that are painted by himself as well as respected masters such as Frans Floris, Simon de Vos, Goltzius, Adriaen Brouwer, Pieter Lastman, Gerard van Zyl, Simon de Vlieger, Hendrik Gerritsz Pot, Otto Marcelis, Willem van de Velde, etc." 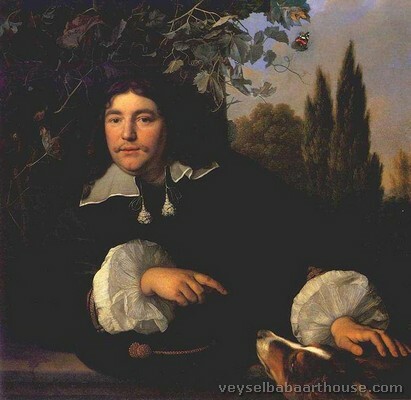 Today van der Helst's most famous portrait is his half-length portrayal of Gerard Andriesz Bicker, the son of Andries Bicker, the mayor of Amsterdam, whom he also painted in 1642. 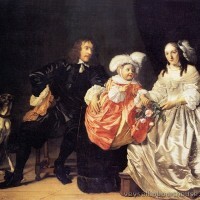 This portrait is often used to depict obesity as a symbol of wealth of the Amsterdam merchants of the Dutch Golden Age in Amsterdam. 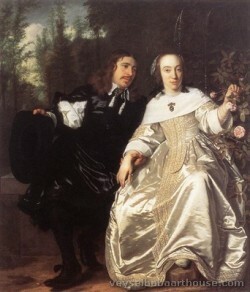 It was probably painted in 1639, the same year as the first schutterstuk where Roelof Bicker is the central figure. At that time Gerard Andriesz Bicker was 17 years old, and held the titles Lord of Engelenburg and High Bailiff of Muiden. It was quite common for artists to win whole family portrait commissions from members of the schutterij after painting group portraits. This is why the competition in schutterstukken became so fierce, led by Rembrandt's Nightwatch.